Copyright: © 2018 Sreekumar H, et al. This is an open-access article distributed under the terms of the Creative Commons Attribution License, which permits unrestricted use, distribution, and reproduction in any medium, provided the original author and source are credited. Giant cell arteritis (GCA) is a systemic inflammatory disorder that affects large vessels. Here we present the case of a 59 year old male who presented to us with complaints of fever and generalised tiredness of 6 weeks duration. He had received 2 courses of antibiotics with no respite. Investigations from outside showed elevated erythrocyte sedimentation rate (ESR) and prostate specific antigen (PSA). He was evaluated in detail as FUO. His fever persisted despite maximal dose of antipyretics, leading to high suspicion of malignancy. However, investigations were not suggestive of any malignancy. On day 3 of admission, he complained of pain on mastication. Examination revealed prominent temporal arteries, with normal pulsations without any tenderness. Fundus examination was normal. With high index of suspicion, temporal artery was biopsied and was diagnostic of giant cell arteritis. Though GCA classically presents with headache, visual changes, masticatory claudication, and symptoms of polymyalgia rheumatica, on rare occasion, GCA may present with fever as the only dominant symptom. GCA without headache is an uncommon presentation, which occurs in nearly 20% of patients. Giant cell arteritis (GCA), historically referred to as temporal arteritis, is an inflammation of medium and large sized arteries. It characteristically involves one or more branches of the carotid artery, particularly the temporal artery . Even though more than two-thirds of patients present with headache, GCA can present as constitutional symptoms such as low grade fever, fatigue and weight loss . This clinical vignette is the case of a gentleman with pyrexia of unknown origin, without headache diagnosed as GCA on evaluation. A 59 year old gentleman presented with 1 month history of fever which was high grade and intermittent associated with myalgia, tiredness and weight loss with no headache, arthralgia or visual disturbances. There was no history of systemic symptoms, comorbid illnesses, smoking or alcohol intake. He had consulted his family physician, screening for tropical diseases was negative and had received 2 courses of antibiotics over the past one month but symptoms persisted. On examination, temperature was 102°F, pulse rate was 106 beats per minute and blood pressure was 120/70 mmHg. His right temporal artery was mildly prominent but was pulsatile, non-tender and was not thickened. System examination was unremarkable except for a mildly enlarged nodular prostate on per rectal examination. Initial investigations showed Hemoglobin of 13.2 g/dL, total count of 6790/mm3 with 68% neutrophils and an ESR of 135 mm/hour. His urine microscopy was normal; so were his blood picture, chest X-ray and electrocardiogram. USS abdomen showed moderate prostatomegaly with a prominent median lobe; Prostate specific antigen (PSA) assay was also noted to be high. His blood culture was sterile and Mantoux was negative. In hospital, his fever persisted despite anti pyretics. He was evaluated further for possible prostatic malignancy with free PSA: total PSA ratio and trans rectal ultrasonography, both of which were less in favour of a neoplasm. By day 4, he complained of neck pain while chewing, which was not there previously. With high clinical suspicion of GCA, in view of a prominent right temporal artery which was pulsatile and nontender and a possible symptom of jaw claudication; temporal artery biopsy was performed – 2 cm of the right frontal branch was obtained for histopathology which was diagnostic of GCA (Figure 1). Figure 1: Biopsy specimen of the patient’s right temporal artery. Thus he satisfied the ACR criteria for GCA and was started on oral steroids, with calcium and vitamin D supplementation, with which he improved dramatically; his ESR dropped to 6 mm/hour within a month of initiating therapy. Ophthalmology evaluation was done prior to treatment and was normal. Angiography was done to rule out involvement of vertebral vessels which was normal. His steroid dose is being tapered at present and he is stable at the end of one year of follow-up. The most typical manifestations of GCA include headache, temporal artery tenderness, jaw claudication, visual disturbances and Polymyalgia rheumatica. In a study by Gonzalez-Gay et al. headache is seen in 87% of the patients with GCA, whereas, 100% cases of GCA presented with headache in a study conducted in south India [4,5]. One in Ten cases of GCA can present as pyrexia of unknown origin; hence it is an important differential diagnosis in pyrexia of unknown origin in the elderly. Though usually low grade fever, 15% patients can develop fever >102°F . 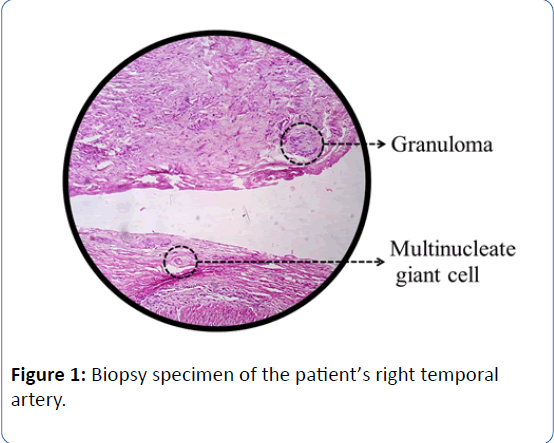 Gold standard for diagnosis of GCA is temporal artery biopsy: Characteristic histopathological findings include panarteritis more pronounced in the media, composed of CD4+ lymphocytes and macrophages. Mean sensitivity of unilateral temporal artery biopsy is 86.9% . Non-invasive methods such as halo sign on colour Doppler ultrasound (Figure 2) are useful but cannot replace biopsy . Operator dependency, variability of equipment, probe settings and technique can affect the accuracy of procedure. Along with these methods the clinical scenario and lab values should be taken to consideration. 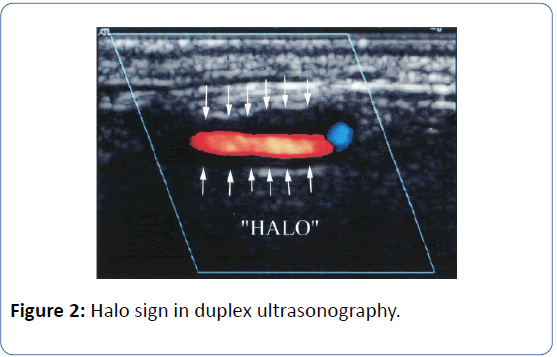 Figure 2: Halo sign in duplex ultrasonography. GCA is considered a medical emergency due to the complication of acute loss of vision. Other early complication includes stroke and late complications include aortic aneurysm and dissection . Management includes oral steroids for a minimum duration of 2 years and low dose aspirin for ischemia prevention. Early visual loss is managed with pulse dose of intravenous methyl prednisolone [10,11]. Initiation of the treatment with steroids should not be delayed for temporal artery biopsy as delay in treatment can lead to visual loss. Treatment with adjuvant therapies like toclizumab, methotrexate etc should be considered if there is relapse on steroid therapy or resistant disease . Magnetic resonance angiogram of other arterial systems should be done as other large arteries can also be affected. The traditional concept of GCA focused on cranial symptoms of headache and visual loss is gradually changing and more attention is given to the constitutional symptoms . • One in Ten cases of GCA can present as pyrexia of unknown origin; hence it is an important differential diagnosis in pyrexia of unknown origin in the elderly. • 20% of cases may present without headache. Kasper DL, Hauser SL, Jameson JL, Fauci AS, Longo DL, et al. (2015) Harrison’s Principles of Internal Medicine (19th edition). New York: McGraw-Hill Education Medical. Gonzalez-Gay MA, Barros S, Lopez-Diaz MJ, Garcia-Porrua C, Sanchez-Andrade A, et al. (2005) Giant cell arteritis: Disease pattern of clinical presentation in a series of 240 patients. Medicine (Baltimore) 84: 269-276. British Society of Rheumatology. Guidelines for management of GCA. Dejaco C, Duftner C, Buttgereit F, Matteson EL and Dasgupta B (2016) Spectrum of giant cell arteritis and polymyalgia rheumatica: Revisiting concepts of the disease. Rheumatol 56: 506-515. Mathew T, Aroor S, Devasia AJ, Mahadevan A, Shobha V, et al. (2012) Temporal arteritis: A case series from south India and an update of the indian scenario. Ann Indian Acad Neurol 15: 27–30. Calamia KT and Hunder GG (1981) Giant cell arteritis (temporal arteritis) presenting as fever of undetermined origin. Arthritis Rheum 24: 1414-1418. Cavazza A, Muratore F, Boiardi L, Restuccia G, Pipitone N, et al. (1997) Inflamed temporal artery: Histologic findings in 354 biopsies, with clinical correlations. Am J Surg Pathol 38: 1360-1370. Schmidt WA, Kraft HE, Vorpahl K, Volker L and Gromnica-Ihle EJ (1997) Color duplex ultrasonography in the diagnosis of temporal arteritis. N Engl J Med 337: 1336-1342. Evans JM, O’ Fallon WM, Hunder GG (1995) Increased incidence of aortic aneurysm and dissection in giant cell (temporal) arteritis. A population-based study. Ann Intern Med 122: 502-507. Hunder GG, Sheps SG, Allen GL, Joyce JW (1975) Daily and alternate-day corticosteroid regimens in treatment of giant cell arteritis: comparison in a prospective study. Ann Intern Med 82: 613-618. Scheurer RA, Harrison AR, Lee MS (2012) Treatment of vision loss in giant cell arteritis. Curr Treat Options Neurol 14: 84-92. Salvarani C, Magnani L, Catanoso M, Pipitone N, Versari A, et al (2012) Toclizumab: A novel therapy for patients with large vessel vasculitis. Rheumatology (Oxford) 51: 151-156.